L & T Opens its casting unit !! Chairman and Managing Director of Larsen and Toubro (L & T) A.M. Naik inaugurated a casting manufacturing unit here on Wednesday. The capacity of the Rs. 120-crore plant is 30,000 tonnes a year. Mr. Naik told presspersons after the inaugural that the foundry would take about two years to reach full capacity production. It would cater to the casting needs of the wind turbine industry.The Coimbatore campus of L & T focused on precision manufacturing and light engineering products.The company’s investment in its facilities here so far was about Rs. 320 crore and direct employment was nearly 500. The company planned to increase this to about 3,000 in a decade. L & T’s investment commitment in the State in roads, ports and shipyard was about Rs. 4,000 crore. This was expected to go up to Rs. 5,000 crore next year. “Tamil Nadu is extremely important for L & T,” he said. Mr. Naik also said that it would start construction of power generation projects (totalling about 7,000 MW) in a couple of years in different parts of the country.The total order book for the company was for nearly Rs. 90,000 crore now.Speaking at the inaugural, Mr. Naik said the company saw a lot of opportunities in the State.It worked with the objective of national building, having a cleaner planet and corporate social responsibility. 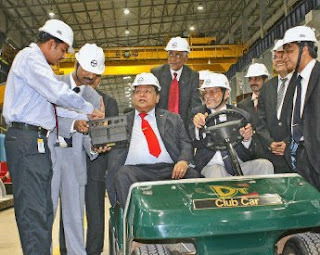 Senior Vice-President S. Raghavan said that the foundry here was established in less than 18 months. It had unique features such as 98 per cent sand reclamation and high quality sand mixers.According to a release from the company, the foundry was located on a 15-acre plot and incorporated state-of-the-art pollution control, fire control and environment conservation measures. The foundry was the sixth facility of L&T in Coimbatore.